The sentencing judgement delivered by Presiding Judge Adrian Fulford attracted attention for its marked criticism of Luis Moreno Ocampo, the former ICC prosecutor’s, handling of the case. Mr Ocampo has since been replaced by the former Deputy Prosecutor, Gambian Fatou Bensouda, after the expiry of his term in office. In what was described as bizarre, Mr Ocampo had recommended a 30-year sentence (the maximum under the ICC statute, except for crimes of extreme gravity and personal circumstances) for Lubanga, which was followed by an offer of reduction in such sentence to 20 years if Mr Lubanga issued a genuine apology and assisted in the healing of communities to help establish lasting peace in Ituri. In another peculiar recommendation, he submitted that the sexual violence that the girl child soldiers suffered be considered an aggravating factor in sentencing. Neither had this charge been pleaded in the indictment nor had evidence been led in the sentencing hearing. 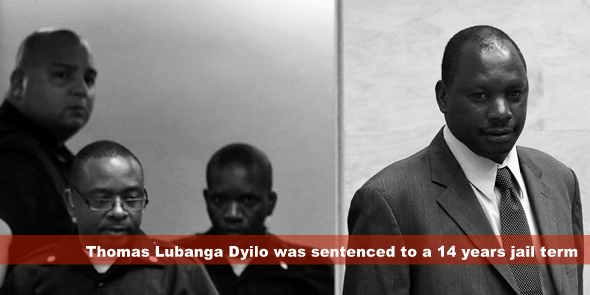 Looking smart in his dark suit during his statement to the Court, Lubanga expressed shock at the guilty verdict and sentencing recommendation, which seemed excessive considering the charges, his level of participation and mode of liability as a co-perpetrator in the common plan. His response and manner came across as eloquent and sincere, and he said had he merely looked out for the welfare of his people when no one looked out for their peace and security. He criticised the Prosecutor’s handling of the events as a ‘masquarade’ and alleged that his referral and indictment was due to political reasons in the DRC. Whether this is true is open to speculation, but it certainly seems as though many of the big fish in the Congo escape prosecutions. However, to the chagrin of the Office of the Prosecutor, the chamber highlighted the failings of the former Prosecutor in handing down sentence and took into account Lubanga’s co-operation with the Court and his respectful attitude as mitigating factors. The Court noted that the Office of Prosecutor had jeopardised the case and the rights of the accused on several occasions. There were substantial problems in disclosure of evidence held by the prosecutor whose sources requested confidentiality leading to two stays of prosecution. The Court also criticised a staff member in the Office of the Prosecutor for misleading the press about the extent of the use of child soldiers in the conflict. No aggravating factors were found to exist and the Court rejected the Prosecutor’s request of sexual violence as an aggravating factor, as this was not proved beyond reasonable doubt. In her dissent, Judge Benito agreed that no aggravating factors were found, but would have the included the harsh punishments and sexual violence suffered by the victims as factors affecting the gravity of the offence pursuant to Rule 145(l)(c) of the Rules of Procedure and Evidence. Response to the sentence varied. ‘As to the punishment, there’s satisfaction there because there’s a sort of public revenge, revenge of justice, because the victims couldn’t have revenge on their own, if you know what I mean’ said the Victim’s Representative for the ICC. Many NGOs welcomed the response, with Armel Luhiriri, Francophone Africa situations liaison for the Coalition for the ICC stating that ‘[t]his sentence sends out a stark warning across the world to those engaged in the use of child soldiers that their criminal actions will land them in prison’. Anneke van Woudenberg of Human Rights Watch said that ‘[t]he trial and sentence handed down today sends a strong message to those who recruit and use children during times of war. Perpetrators who continue to commit this crime should sleep less easily now they have seen the seriousness with which the International Criminal Court deals with such crimes’. The Chamber noted the real danger of the exposure of the children to harm as well as the extent of harm caused to the victims and their communities as well as the crimes’ effect on the international community to be relevant to the sentence it handed down. This attempt to send a clear message marking the end of impunity for international crimes is the standard justification in many of the cases heard at the international level. These and other statements are received with some scepticism with the current prosecutions being criticised for their undue focus on Africa and perceived political agenda. The recent resubmission of a warrant of arrest for Bosco Ntaganda for his role in the same conflict reinforces this sentiment. Many commentators seem to portray marked faith in the values of international moral order being promoted in these prosecutions but have little understanding of or sensitivity towards the conflicts in these areas. In fact, it is even unsure if these prosecutions bring closure for the thousands of victims or deter further atrocities. The current Russian veto in the UN Security Council to block the referral of the situation in Syria is also another interesting factor that is noted by many to reveal the disparities in treatment between those countries with powerful allies, and those without. It is yet to be seen how the ICC will fare under the regime of the new prosecutor and whether it will have the independence and political support to pursue its investigations and prosecutions with a level of independence and fairness – and contrary to some, faith is not enough to ensure a viable and efficient system of international justice. Rebecca Browning holds an LLB degree from the University of Cape Town, South Africa and is a former Intern at the Special Court for Sierra Leone. She is currently an LLM candidate at the University of Amsterdam in the Netherlands.